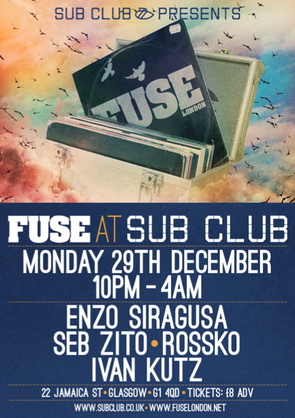 Fuse continues to spread its wings with their next UK debut event. On 29 December the brand will venture to Sub Club in Glasgow to mark the end of 2014 with a special six-hour showcase. For the visit, Enzo Siragusa will be supported by Seb Zito and Rossko, and will join Ivan Kutz for the party. 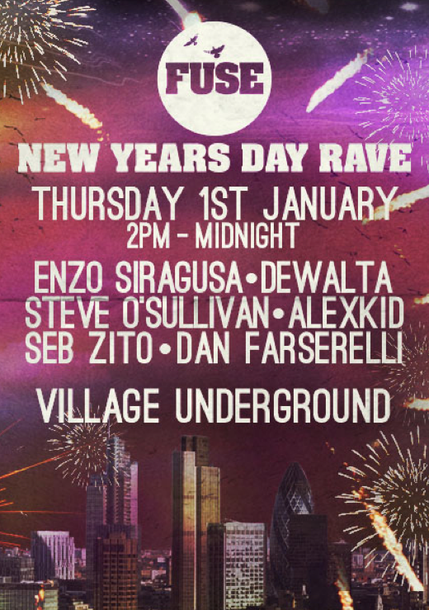 The brand will also see in the New Year in style with a New Year’s Day event at Village Underground in London. Running from 2pm – midnight, the party will see FUSE regulars Enzo Siragusa, Alexkid, Seb Zito and Dan Farserelli joined by Dewalta from Berlin and the UK’s very own Steve O’Sullivan of Sushitech and Mosaic records. Since its inception in 2008, and with their sixth birthday on the horizon, FUSE has established itself as a London club night and a player on the international clubbing circuit, hosting over 300 events across Europe and around the world whilst also launching two record labels; FUSE LONDON and INFUSE. Having completed another season at Sankeys Ibiza this year, the brand’s profile continues to grow.